Opticianry education entered a whole new stratosphere when the new Georgian College Optical store opened this past September. Housed within the Sadlon Centre for Health and Wellness, the teaching store combines state-of-the-art equipment with superb design, displays and fixtures. The store is open to the public, as are several clinics for other health care practitioners which are housed in the $62.5 million dollar centre. These include a nurse-practitioner-led clinic, a clinic offering basic dental care, and clinics for massage therapy, speech, language and hearing services. In January, a spa and esthetics clinic will be added. 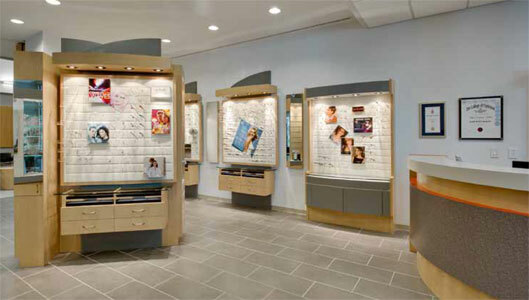 Modular Design System’s display units make it easy for those entering the store to quickly see what is available. “The entire surface can be easily modified with display posters and other brand identification. Branding creates a welcoming and visually stimulating environment and makes a strong impact,” explains Wolcovitch. The store is mainly white, with red accents on the furniture and walls. The sense of pride that both Schmidt and Wolcovitch feel about the store will no doubt be passed along to opticianry students. “Some of our grads have come to see it and said they wish they were in school again,” notes Schmidt. This entry was posted in Education by Envision Magazine. Bookmark the permalink.